Alright, so speed can be defined as "the distance covered in a unit of time," or basically "how fast something is moving." It, like distance, is a scalar quantity, and doesn't show distance. Velocity, on the other hand, is a vector and is essentially speed with direction. We can also define velocity as "the rate of change of displacement," whereas speed is simply "the rate of change of distance." Velocity, as a vector, can be added or subtracted, an idea that we will explore in more detail when we get to the topic of relative motion. Speed and velocity is usually defined over an interval, but in some cases, we might need the instantaneous speed and velocities, which, as the name suggests, is basically the speed or velocity at a single given time, so it can't be calculated with distance or displacement over a time interval, since there is no interval. 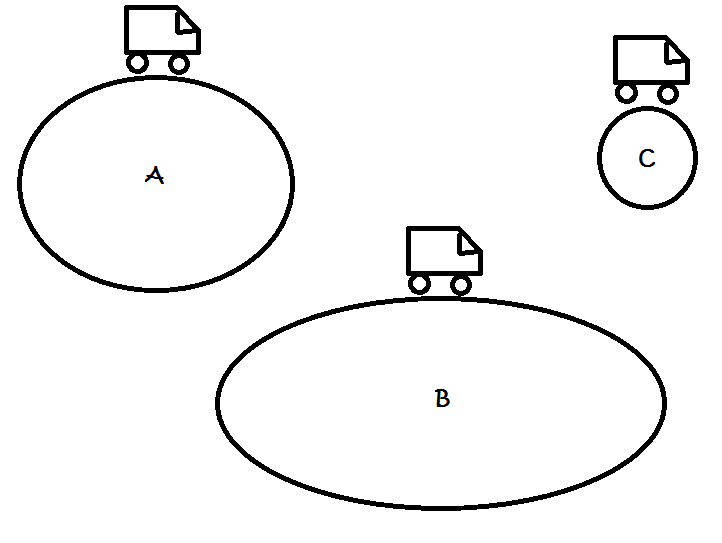 Assuming Person A (Justin) and Person B (Howard) both reach the set destination (which is equal distance from each of them) in the same amount of time, Justin would have a much higher speed, but in terms of velocity, Justin and Howard were the same. Now we also have something called acceleration which is essentially an object's change in velocity over a given time. Again, acceleration, just like all other vectors, can be added or subtracted. Now remember, this is the change in the displacement over time, so we must take into account the direction. Typically we find acceleration in problems with linear motion, but must remember that the change in velocity also happens when an object turns. Observe below. If we consider the three cases above: Car A driven by Joycelyn, Car B by Enyu, and Car C by Abigail, where Joycelyn is driving at the same speed as speed as Abigail, and it takes Enyu the same amount of time to complete a full lap as Joycelyn. It is understood that both Enyu and Abigail as a higher acceleration than Joycelyn, due to more change in velocity, one due to a greater velocity in terms of displacement over time, and another due to a greater velocity in terms of more change in direction. Then we have something called free fall. It's a lot simpler than it sounds. Simply put, it's the work of the gravity exerted by the planet Earth. This force of gravity causes all objects to have a downward acceleration of 9.80665 m/s^2 (This number is typically rounded to 9.8 or even 10 in calculations). Just like in horizontal linear motion, the same ideas apply, the object is just moving in a different direction. Consider the graph below, which are just a number of different ways of portraying the same act of free fall. Below you'll find a race between a Yamaha R1, a Porsche 911, and a typical European fighter jet. Which has the largest acceleration? Final velocity?